During your lifetime, your Model Offshore Trust might go unnoticed by anyone who is sizing you up for a lawsuit. But because of the strictly enforced reporting obligations that fall on any U.S. person who transfers assets to a foreign trust, your Model Offshore Trust won’t be private from the government. The government will know all about it. The Trustee, being an institution located outside the United States, won’t be subject to any U.S. reporting requirements. And it will have an obligation not to volunteer information about your Trust to any third party. No member of the Beneficiary Class would have a reporting obligation because none of them has a fixed or determinable right to a specific portion of the Trust. They are protected by the discretionary nature of a Model Offshore Trust. Your successor as Protector normally will have access to all information about the Trust. But none of the powers held by a Protector of a Model Offshore Trust trigger any reporting obligations. And if the Protector every came under legal compulsion to report on the Trust (for example, if he were under a court order or if U.S. reporting rules changed), the Trustee would have a duty to limit the Protector’s access to books and records. After you, no one will have an obligation to report on the Trust you have left for your family. It can be lawfully silent and lawfully invisible. However… A Beneficiary who receives a distribution is required to report it, even if no portion of the distribution is taxable. In some situations, the desire to get the lightest tax treatment on a distribution may put a dent in the Trust’s privacy. You can learn more about how your heirs can achieve maximum lawful privacy for your Trust in the Offshore Trust Guidebook. The cumulative effect of U.S. reporting laws is to prohibit financial privacy for anyone who wants to achieve it for himself. You can't have it. However, you can provide the highest level of financial privacy for your heirs. You do so by establishing a Model Offshore Trust. After your lifetime, no one will have an obligation to file any reports to the IRS or to any othe U.S. government agency about your Model Offshore Trust. 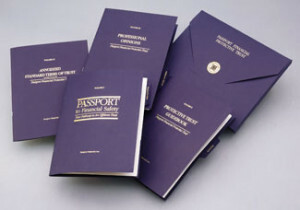 Passport Financial's Offshore Trust Kit makes it suprisingly inexpensive to provide lawful financial privacy to your heirs.